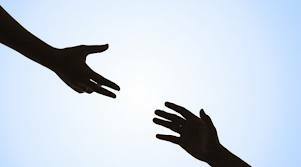 Lending a hand is an act that arises out of Empathy. When we ‘imagine’ what an experience is like for others, it is our human-born ability to empathize at work. It’s a valuable insight for us to recognize this in ourselves, to ‘re-call’ it from the depths of our early being, to restore it, and to put it into practice. If we did – war, and many other forms of violence, would be impossible. I began this post as a note to attach at the end of my original post on the disturbing event of 3 teens in Duncan, Oklahoma, shooting and killing an Australian exchange student. In that post I explored America’s culture of “emotional detachment” from understanding suffering of others. My ‘brief note’ became commentary on culture with a review of history and economics. It grew to be very long – I’m posting separately. I invite you to ‘scan/review’ these thoughts with me. As always, comments are welcome! The people of Duncan, Oklahoma, and those who best know the boys charged with the killing, are troubled. We would expect them to be. We can imagine it. What they’re experiencing is what we’d experience if this shooting had happened in our communities. Reflections of citizens of Duncan are described in this LA Times article. The article is fairly brief, and doesn’t feature many people, but I recommend reading it – it does let us know a bit more about the town. There are many observations that can be made. Culture is definitely involved – culture of the town and of the region seem to dominate thoughts, feelings, puzzlement and possible understandings of the people of Duncan, Oklahoma. This, too, is ‘as it would be’ if we examined beliefs and habits in our own communities. Wherever we live, our cultures have ‘regional flavor’, (for example dense urban rather than suburban-rural). We must leave ‘particulars’ of their culture to them. The Duncan shooting can’t help but be linked to its culture. But it’s also true that shootings and other forms of shocking violence happen many places, including communities – yours and mine. Is my claim in my original post – that America needs to notice its “pathological detachment” – too far removed from Duncan’s culture, and the shock they are experiencing, to be helpful to them? Maybe – at least as a starting point, the national culture is probably ‘too big a picture’ for a troubled town to work with at this time. But what about the rest of us. If the people of Duncan – for reasons we well understand – ought not be expected to tackle a problem of “emotional detachment” in the national culture, then who’s to do so, and when? Will those of us not presently caught in shock of senseless violence stay detached until our own communities are similarly stunned? Community and regional cultures, and sub-cultures that exist within those – however unique – do not operate in isolation from larger ‘umbrella’ (national) cultures. Feed-back among many ‘layers’ of culture is constantly in motion. The culture in Duncan, Oklahoma, is ‘informed by’ the larger, national, American culture. What is important for Duncan is important for all of us. How did we ‘get here’? I want to share some thoughts about a fairly recent experiment of American culture and what happened to that experiment. This is my personal ‘narration’ – my story telling – of one way we might understand current American culture in 2013. It’s a highly generalized and grossly over-simplified sketch of changes since WW2. What was ‘then’ and what is ‘now’ have strong effect on our culture – in Duncan, and everywhere else. “Economics” – economic policy and forces that shape those policies – are involved in how we ‘feel’ about our lives, our communities. This is true in Duncan, Oklahoma, and across America. In the late 1960’s, the United States had a ‘rising culture’ that was influential in anti-poverty and anti-war policies. Those born too late to remember it, or who’ve not heard much about it, might be surprised at how different that rising culture was from what we now have. After WW2 the US prospered compared to all other major nations because we’d not suffered the damage or losses experienced by ‘competitor nations’. By the 1960’s, we were willing (some Americans more than others) to “share the prosperity” in anti-poverty and other social benefit programs, and to promote anti-war stands. Our position of comfort made ’empathy’ with others easier in the 1960’s than it is now. 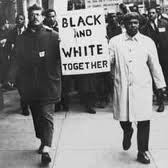 Civil rights marches covered a range of issues – desegregation, jobs, voting rights and more. The marches gained support because empathy was a more active ‘driver’ in our thoughts. Not all ‘radical’ war protesters during the 1960’s were ‘hippies’. This woman is dressed very ‘respectably’ – is perhaps an office or retail worker – could have a low to mid-level management position – and is wearing heels! I suggest widely shared social benefit developments of the 1960’s were a ‘rising‘ culture because they did not endure long enough to become ‘a new way’. Economic conditions that underpinned a culture of “share the prosperity” changed. The story of influences that ‘dampened down’ anti-poverty, anti-war, and social benefit measures is a complex study and began at least by the 1980’s if not before. A really big factor was that ‘competing nations’ destroyed during WW2 finally recovered and entered global markets. “Suddenly” those with greatest wealth in the US realized their wealth might be at risk; social benefit programs became something of a problem to this group. Consumer dollars keep the economy going. All our ‘security’ is tied into the “buy more stuff” system. Reduced or absent opportunity to find (and experience) satisfying employment due to a range of factors beyond individual control is a very real, a very destructive, problem. Our economic system that allows wealth accumulation for this group has built-in needs that conflict with wide sharing of social benefit. In order for wealth-seeking individuals and their corporations to be successful, they must meet three demands of the system. The system has to (1) ‘sell stuff’; it has to (2) find new resources and new markets; and it has to (3) maximize profit. Without these three, the system as designed can’t function. None of these ‘must have’ needs or our economic system involve empathy. In order to respond to developing competition from war-recovered major nation trading partners, the largest US manufacturers needed to cut production costs. There were several significant ways this was done – outsourcing jobs to other nations where social benefits were less valued was one of these. Increased use of mechanized and robotic solutions was another. Finding ways to increase consumption (selling stuff, especially by ‘the science of manipulative advertising‘) was yet another. In the late 20th Century, American wages stayed flat adjusted to inflation while productivity rose. This did boost profits, but gains were generally used to pay for outsourcing costs and to purchase more automation. At the same time, CEO salaries and benefits in large corporations, compared to regular employees, (as a ratio), rose dramatically. Key changes in tax and banking policies made it easier for rising profits, (wealth), to stay ‘at the top’, to not end up in worker wages. More families became 2-income families – first to purchase ‘frills’ but increasingly to cover real costs, especially education and health care. Interest paid on loans is obviously an income opportunity for lenders – ever seeking ‘new markets’, lenders encouraged consumer debt. 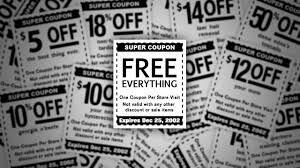 Advertising to promote credit-based sales, began to play a larger role. Advertising (public relations) was and is the means used to ‘invite’ or ‘convince’ us to buy more stuff, and to use credit if we’ve not got cash. Advertising “really took off” in the 1990’s. All of us are deeply entangled with this economic system. Everyone living in Duncan, Oklahoma, and everyone living in all other American communities. Bad mortgages and job losses, (along with closing of public services and schools, and lack of access to health care), and other financial hardships are direct consequences to our lives of what ‘the economic system needs to do‘. We can be told ‘those people’ are our enemy – and suddenly manufacturers of small and large arms and munitions can ‘sell more stuff”. We can be told ‘borrow money to buy this house and it will increase in value’, and if the sales pitch is effective, we’ll sign a mortgage document that’s not appropriate for our situation. The lending corporation is not so concerned about that – it needs to ‘sell stuff’. I could go on … listing ways we’re entangled and ways we’ve accumulated debt, and have come to mistrust, even dislike, one another, but won’t. “Anxiousness” is a key underlying ‘felt’ experience of many Americans even though many may not recognize this in themselves. In captions of two images with this post I describe empathy as a human-born ability. I’m convinced we all have the capacity. We learned early to restrict it to people closest to us, and to people ‘most like us’. With each economic downturn we feel our personal well-being at risk, and we’re inclined to restrict empathy even more. In a different culture, in a different environment, we might have learned to expand, rather than restrict, empathy. But we’ve created an economic system that “says” rising unemployment and poverty are “regrettable but OK” so long as they happen to ‘somebody else‘. Paying attention to increasing impoverishment of others, when we’re anxious about meeting our own basic needs, or feel we’ve ‘knocked ourselves out’ just to make what gains we now enjoy, is not comfortable – can even feel stressful. Emotional detachment has become one of our strategies to avoid the stress of feeling empathy. “Empathy … the ability to imagine or project oneself into another person’s position and experience all the sensations involved in that position.” From my experience with young children, I consider empathy to be an intuitive, spontaneous, capacity with which we’re born. These children can’t articulate what they’re doing – they just “feel” the reality of another’s experience. We are ‘taught’ to ‘curb’ the experience of empathy in order to better “look after No. 1” and in order that we’ll be more compliant with us/them group values. Anti-poverty and anti-war aspects of our late 1960’s culture were not perfect by any means. For one thing, not all individuals in the ‘counter culture’ managed to leave self-centeredness behind. But many did – by intention. ‘Common weal’ community behaviors and experiments were generally sincere and informed. Overall, the cultural beliefs of the time – in the counter culture but also in general society – did tend to emphasize and encourage win/win over win/lose. They are worth recalling to remind ourselves that our present cultural attitudes – that ‘impoverishment is OK so long as it happens to someone else’ – is not our only choice. We’ve tried empathy before, maybe it’s time to try it again. It’s critical to acknowledge the optimism and drive for a better society was as large and deadly a struggle as any other committed challenge to status quo. People went to jail. People were beaten; people were killed. Some houses and churches were bombed. The link accompanying this photo is specific to civil rights, where violence was greatest, most deadly. 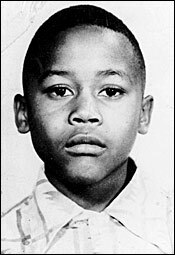 This young 13 year old boy, Virgil Lamar Ware, was shot dead by teens who’d come from a segregationist rally on Sept. 15, 1963. He’d have been 63 this year. Southern Poverty Law Center. (www.splcenter.org/civil-rights-memorial/civil-rights-martyrs) NOTE RE HISTORY OF THE 1960’s: I’m not only not an economist, I’m also not a historian. I appreciate that I’ve scarcely mentioned the tensions, violence, and even chaos of that time of change. Before it was finished, and contributing to its finish, we had 3 assassinations of 3 powerful leaders: President John F. Kennedy; his brother as candidate Robert Kennedy; and Dr. Martin Luther King Jr. I’ve emphasized Civil Rights and anti-poverty accomplishments because I believe they show us what we were capable of doing. I emphasize our inborn capacity for empathy because I believe it at the heart of who we are. Even now, in large overwhelming numbers, we- the American people – want all people of our nation to experience satisfying and rewarding lives. Most ‘rights activists’ of the 1960’s were strong believers in the best of America’s traditions of freedom, democracy, and attention to community (common weal). Activists of the 1960’s didn’t invent ‘new dreams’; dreams of freedom, democracy, and ‘thriving individual in thriving community’ have long been present in the spirit of human community – in the United States and elsewhere. We saw a revival of these “community building; grass roots level” explorations in freedom, democracy, and attention to common weal with Occupy (link). The Occupy Movement’s influence and activism continues with many participating, but so far – we remain entangled in a system that ‘needs’ for us to fill the role of consumer – and that system requires ’emotional detachment’, which in turn discourages empathy-driven policy. Empathy leads to interest in one another’s potential to become thriving participants in thriving society. It’s incompatible with ’emotional detachment’. 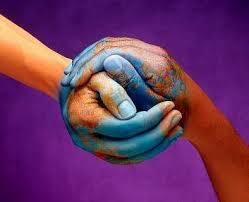 We can’t deny another’s potential (locally, regionally, nationally, or globally) – and be ’empathic’ at the same time. It is “emotional detachment” that lets us restrict empathy, and lets us “reasonably deny” others the opportunity to thrive. The people of Duncan may need to keep their thoughts centered on the situation in their community. I hope they do, I hope they do so with some wisdom, and I wish them well. But important factors in Duncan’s culture are present in American culture across the land. The rest of us, while we are not in Duncan’s crisis, might best help by giving thought to our own local/regional cultures and follow-through with thought about our national culture. What do we want our American culture to emphasize and encourage – empathy – or emotional detachment? What is ‘real’ prosperity? How much ‘stuff’ does it take to experience it? What do we mean by ‘thriving’, and does it include earth itself? Is earth-stewardship – rather than extreme and devastating resource exploitation for the sake of jobs – something we need to look at? Can we find other ways to assure homes, food, education, and health care? These are only a few questions of many we could be discussing – because what happened in Duncan is an outgrowth of our present cultural practices. ‘Individual thriving in thriving community’ seems a very good goal to me. 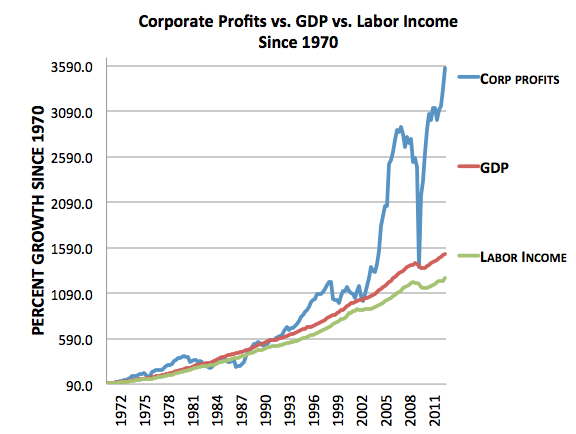 LINK to economic writer Derek Thompson’s August 13, 2013, article in Atlantic: “Bash Brothers: How Globalization and Technology Teamed Up To Crush Middle Class Workers” Informative for general readership and supplemented by graphs. See also: A Case for Developing and Nurturing Empathy – Post includes a 10 minute video based on Jeremy Rifkin’s book “The Empathic Civilization”. Gallery | This entry was posted in Justice/Rights, Philosophy/Psychology/Human Nature, Social-Political, Universal family and tagged American culture, american economic history, American society, Australian exchange student shot, Duncan Oklahoma shooting, emotional detachment in politics, empathy. Bookmark the permalink.